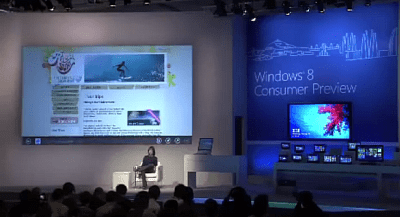 Microsoft’s Windows 8 Consumer Preview keynote at Mobile World Congress wasn’t streamed live last week. But we have the full 90 minute presentation here. Last Wednesday, I was up all night anxiously awaiting the Windows 8 Consumer Preview keynote by President of Windows and Windows Live Division, Steven Sinofsky at Mobile World Congress (MWC). Although it wasn’t streamed live, you can watch the full 90 minute keynote here. During the Keynote, the Windows 8 Consumer Preview was made available for download. Microsoft said on its Building Windows 8 Twitter account the Consumer Preview had more than 1 million downloads in 24 hours. If you missed the keynote at MWC, it’s now available to watch online. You can watch and download it at the Microsoft News Center. Or just kick back and watch it here. If you’re a Windows fan, watching this keynote is very interesting. They move through the presentations quickly, but it gives you a solid overview of what Windows 8 can do. It’s especially interesting to watch the demo’s of Windows 8 on tablets. We’ll continue our deep dive into Windows 8 Consumer Preview and bring you the best How Tos, Tips, News and Reviews of the new Windows version. Make sure to keep coming back to see more. And subscribe to our Newsletter.